← Ironman: Call for Volunteers! Over the past two weeks, my social media newsfeeds and photo streams have been blowing up with posts and images of bear sightings here in Whistler. Ah, it is that time again, isn’t it? With the first signs of post-hibernation being on the very last day of March when a few Instagram posts of paw prints in stale snow surfaced. 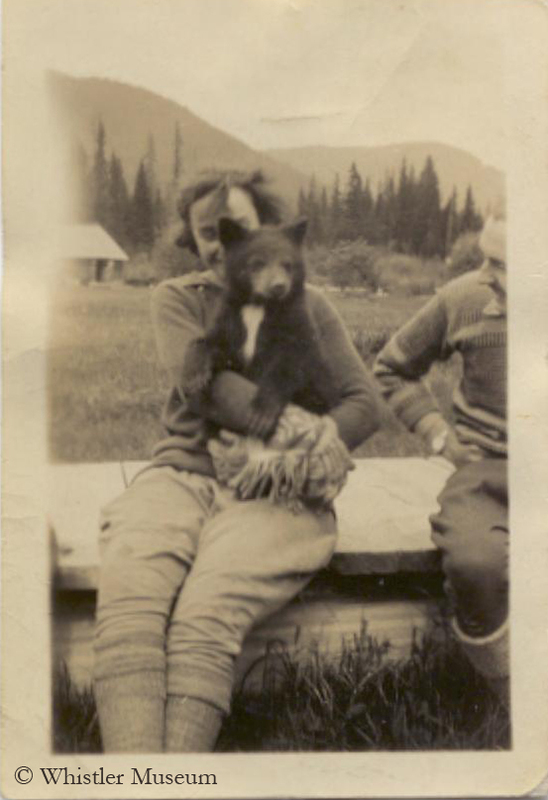 Myrtle Philip holding Teddy the bear, ca. 1925. Philip Collection. With each new bear sighting comes varying emotions: some people feel fear, others joy, and for many uncertainty. Whistler locals love sharing their bear stories, often suggesting that black bears are generally quite harmless to humans. One local, Colin Pitt-Taylor, claims he accidentally cycled into a black bear; Colin leaving the scene unharmed, and the bear leaving seemingly unfazed. Another local and avid golfer, Colin Gower, claims to have come rather close to numerous bears along the Nicklaus North golf course. This is no surprise, as black bears have settled into our golf courses, ski hills and parks (even though they’ve inhabited Whistler long before us humans decided to move in). Today, most Whisterlites have a high level of respect for bears, and in fact, bears have been held in such high regard as far back as we can trace. Archaeological evidence suggests that bear worship (also known as Bear Cult or Arctolary) may have been a common practice among Neanderthals in the Palaeolithic periods. Bear worship did not stop there. To name a few examples: Celts believed bears to be incarnations of the goddess Artio, the Ainu people of northern Japan considered the bear to be the head of the gods, and First Nations throughout North America honour the bear with costumes, masks and images carved on totems. It is clear that bears have been admired by humans throughout history, but even still, when pioneers came to settle here they began hunting and slaughtering bears, exploring new territory and clearing land for their homes. Grizzlies were virtually exterminated from the Canadian Plains and the western United States, and at this time, bears were generally regarded as human-eating monsters – a much different take on bears than our archaic predecessors might have reasoned. 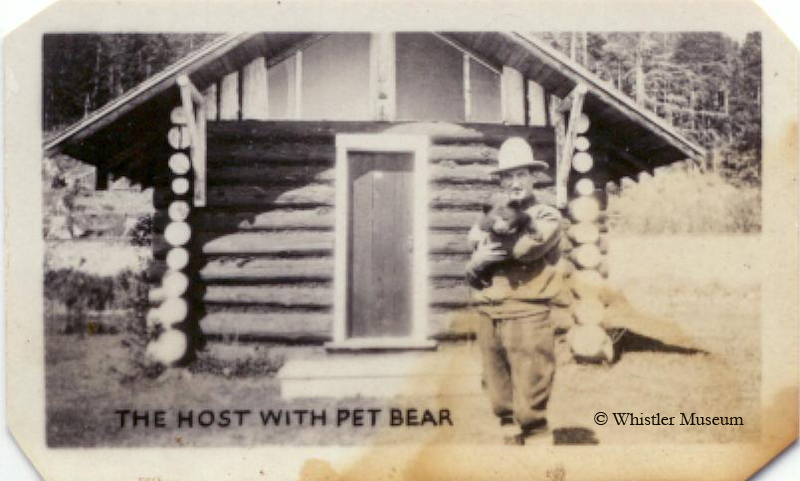 Thankfully by the twentieth century, public perceptions of bears began to shift. Laws limiting hunting were enacted and residents of national parks realized the importance of coexistence. However, at this time, bears were often used as amusement; tourists would feed them and gather around the centrally located garbage dump to watch as bears fed on our waste. 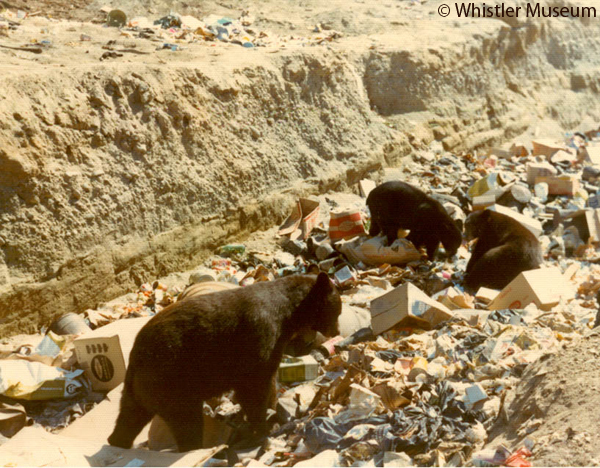 Bears in the garbage dump (future site of Whistler Village), ca. 1965. Petersen Collection. Jump to the present day and we seem to have greatly improved on this coexistence thing. Laws and regulations have been enforced to protect bears, further limiting hunting and keeping our food and waste secured in bear-proof bins and depots. Most Whisterites and visitors have adopted a deep level of respect for our approximate 100 black bear residents, understanding these ursine beauties as independent beings, crucial to our ecosystem. Alex Philip holds Teddy the bear, 1926. Philip Collection. While it is true that most run-ins with bears have proven harmless, it is important to stay safe and know proper bear safety. Visit http://www.bearsmart.com/ for a great resource on how to be bear-smart! 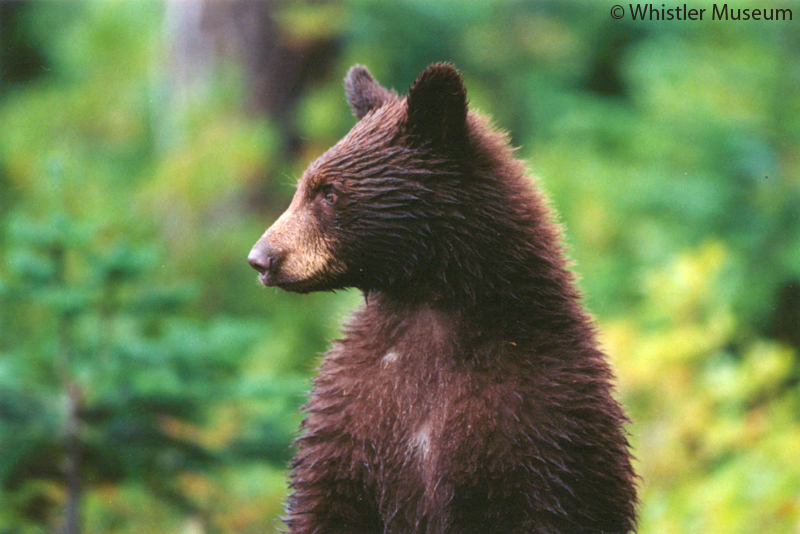 This entry was posted in Wildlife and tagged bears, black bears, Whistler, whistler wildlife. Bookmark the permalink.